It's been... 8 months since John and I moved in together into this house. Time flies, doesn't it? And I gotta say, he doesn't have too many annoying habits! Some people said it would be tough, but those people are (a) my mom, and my dad is HARD to live with, I have 18 years of my own experience of that and (b) a friend, who pretty much constantly rags on her husband. I tell her that's her reality, not mine. That's not to say he's not without annoying quirks. I'll tell you one - he's the king of leaving his dirty clothes on the corner of the floor in his bathroom. He could throw them down the stairs towards the laundry room, or put them in the laundry basket in our closet next door to his bathroom, but nope. I've thought about moving the laundry basket into the linen cabinet in his bathroom, but I'm quite sure he wouldn't use that either. It's really not that bad of a habit though, at least not to me. After he leaves for the morning, I just pick up his clothes and take them downstairs to the washing machine, which I'm walking past on the way to my bathroom anyway. No big deal. And considering that I've taken the trash out since we've moved in exactly twice (by myself, at least), I consider it a more than fair trade. But you know what else my mom said? That I would be the one that's hard to live with! Can you believe that?! Nonsense. Alright to be totally fair, I was harder to live with in high school, as she experienced it. I would come home late and wake the dogs by opening the garage, which would wake my mom. I would sleep in, I never did laundry, I never vacuumed, I never made my bed. I was always queen of keeping the kitchen clean though, she knows that. I've matured over the years though, mom. I'm easier to live with now. I'm bad about making the bed. I guess this one hasn't changed much since childhood after all. In my defense, it's not even about 'well I just get back into it at night,' it's the fact that Hawkeye un-makes it literally minutes after I finish. It's maddening! I know that making the bed is important. It makes the room look neater, even if you have other stuff lying around, it makes you more productive during the day especially on weekends or if you work from home so you don't crawl back into bed, I don't have to run and shut our door if people come over - I am perfectly aware of all of these things. But I just. can't. do. it. It's on my goals list this year, one month I'll just dedicate to bed making. No other goals. Just make the bed every day. I leave coffee mugs out during the day. I tend to take my coffee downstairs after John leaves, because that's where my bathroom (and thus hair and makeup things) is. I'll usually put something on Netflix or YouTube to watch while I drink coffee and get ready. And then I never remember to bring my mug back upstairs to the kitchen. I'm so good about all other dishes, and of course I correct the mug issues once I get home from work, but I don't know why I just leave it down there all day instead of putting it in the dishwasher first thing. I re-wear clothes before washing, but don't always put them away nicely. I think most girls do this, especially those of us with office jobs who don't get particularly dirty - you can wear clothes, especially pants, more than once before you wash them. And jeans?! You can wear them like a month, right? I don't think re-wearing stuff is a bad habit, but the way I keep the stuff between wears definitely is. Which is a ball in the corner of my closet, on top of my boots. I don't always do this, but it happens often enough. I get home super tired and change into pjs right away and leave the stuff I was wearing in a corner in the closet, and once that happens it'll tend to sit there until I pick it back up to wear again (at which point it's often ready for wash, not re-wear, which defeats the whole purpose.) Shoot, maybe John got his clothes leaving habit from me?! I swear I'll work on these. Some day. I can't be the only one... right? 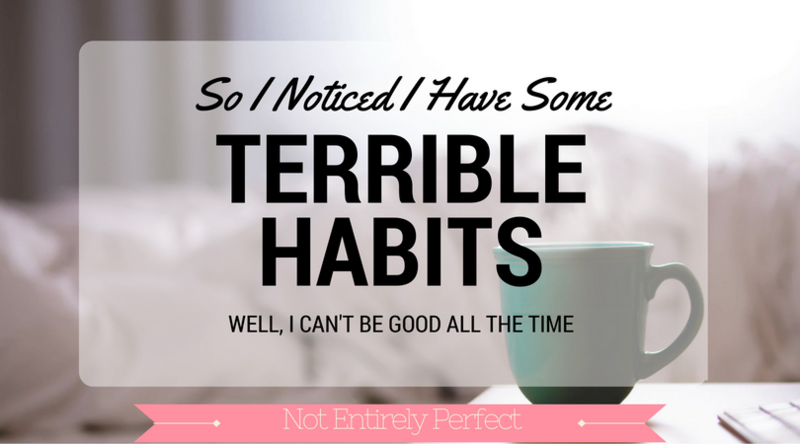 What are your worst habits? Thanks so much for stopping by. You can also join me on Instagram, Twitter, and Pinterest. In addition to minimalism and organizing, I love all things 'real life' so use the hashtag #notentirelyperfect on social media so I can see your beautifully unstaged life. On the top of the side bar to your right, you can follow me on Bloglovin or subscribe via e-mail to be alerted to each new post.